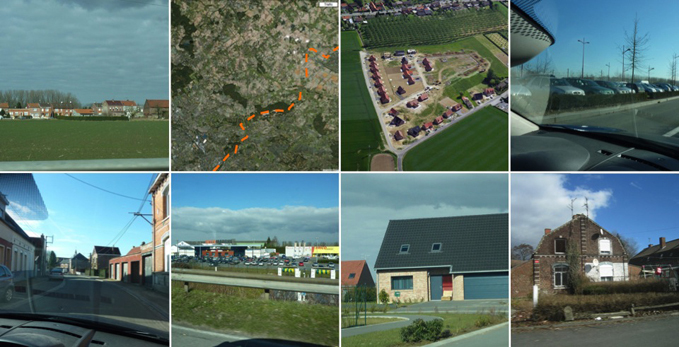 Posted by admin on July 17, 2010; This entry is filed under France, Nord-Pas-de-Calais, Periurban Area, Pévèle, Pévèle > Periurban area > Nord-Pas-de-Calais > France, Project Introduction Text. The project aims at exploring both sustainable and quality ways of living between cities and countryside in periurban areas of Nord-Pas-de-Calais in the North region of France. The project is at a very early stage. The intention is to set an action-research development process based on the idea ‘regional acupuncture’ or the sustainable transformation of a place through a network of local projects. The challenge of the experimentation is inspired by the metaphor of the traditional acupuncture which s to say to reach a transformation at a systemic level through the activation of a reduced number of local targeted initiatives with a synergetic potential between them (Jégou, 2010). 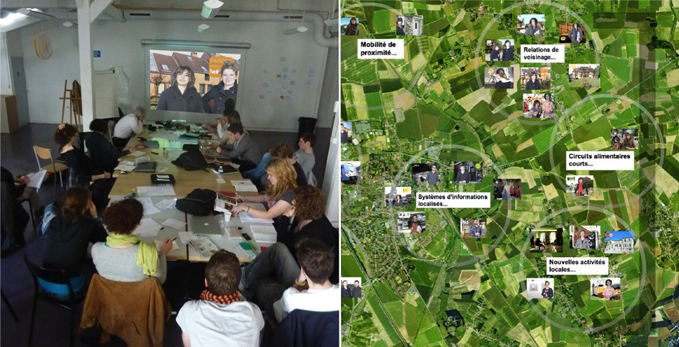 The project originated early 2008 with a collaboration between the Direction of Sustainable Development, Foresight and Assessment (D2PE) of the Regional Council of Nord-Pas-de-Calais with the public innovation laboratory, La 27e Région and in particular with Territoires en Résidences, its programme of real scale innovation camps settled in public institutions in different French regions. La 27e Région in collaboration with the sustainable innovation lab Strategic Design Scenarios are promoting a first experimentation of regional sustainable transformation through a acupuncture of residences. The Nord-Pas-de Calais Region with the help of a local development agency proposed to work on the future of the periurban area. This paper will describe the starting process of this project. It will outline the characteristics of the local context where the project starts and describe the first exploratory workshop with a group of students from ENSCI design school in Paris to investigate both possible areas of local projects and transformation strategies for the periurban areas. In conclusion the possible follow-up development in discussion at the moment when this paper is being written will be presented as well as the roles of design-based activities all along the project process. The Pévele area between Lille, Douais and Valencienne is typical of periurban areas and its related problems in the very densely urbanised region of Nord-Pas-de-Calais in the North of France: high request for buying houses; strong urbanisation pressure; villages developing along the roads and construction programmes of groups of small independent houses popping everywhere; destruction of agricultural land; difficulties to maintain social mix and balance between generations; local shops disappearing; strong commuting; heavy transportation traffic… all these phenomena together tend to generate a sort of unsustainable ‘dormitory countryside’ more and more shifting towards a urban sprawl with social tensions and poor living qualities. Beyond this rather difficult situation, the analysis of Pévèle area reveals a series of potentials and possible directions of investigation towards improved sustainability and living qualities in these periurban areas. Relocation of ways of living is of course limited because of low employment available in the periurban but still revitalisation of towns and villages centres, better mix between habitat, commercial and service areas and development of local distant / co-working facilities can be achieved. The concerns for the reduction of the average transport intensity seems to push emergence of more dense forms of habitat and a richer mix of populations around public transport infrastructures. The potential of social solidarity is very high starting from the strong community and associative dynamic inherited from former worker fabric till the new emerging shared resources of car-sharing, third places, community gathering places, etc. The strong industrial past leave a large number of unused infrastructures and buildings that begins to be slowly refurbished in multi-purpose creative places mixing cultural infrastructures, social centres with logging or hosting facilities. The cultural dynamic is still very strong with vivid popular festivals and local annual events where for instance the contemporary art scene is developing with unexpected success. Although already lacking of clear zones of nature, the Pévèle landscape and its architectural heritage reveal potentials for local tourism. Part of the active farms slowly involves in organic traditional quality products distributed in local food networks and derived hosting and gastronomy activities. The workshop organised at the ENSCI Les Ateliers, Paris by Strategic Design Scenarios proposes to explore in vitro how a network of local micro-projects working in synergy, could organise as a sort of acupuncture of the region and generate a systemic transformation towards new and more sustainable ways of living. The context of the Pévèle and the periurban situation in Nord-Pas-de-Calais in general has been documented carefully in collaboration with the Syndicat Mixte du SCoT di Grand Douaisis, a local development agency and was introduced by a responsible form the D2PE department of the Regional Council. The workshop activity is in line with design approaches to support social innovation towards new and more sustainable ways of living (Jégou & all 2009 and 2008; Manzini 2009, Mulgan 2006 and 2007, Thakara 2005): Collaborative neighbourhoods; local food networks; alternative mobility; exchange and mutual help platforms; active welfare; multi-services centres; community-based tourism… a large range of examples collected worldwide by the design schools of the DESIS network were discussed to see if and how they could inspire new sustainable living in the region. 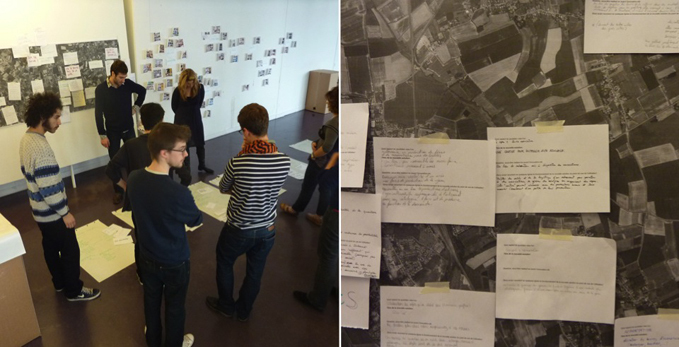 Each new tentative solution was positioned on a map of the Pévele area, then visualised and discussed… Which potential synergies between these independent projects? How to organise them in a system of distributed innovations in the region? More than 30 solutions have been generated and presented in the shape of short video-sketches. They organise in 7 strategic points to open the debate on which framework strategies could generate synergies between local initiatives. For each of the 7 points presented below, a tentative description of a framework strategy is proposed referring each time to the different service initiatives –between parenthesis– imagined by the students. To facilitate the life of commuters, local train stations as Orchie heading towards larger cities around need to become hubs of services for instance integrating systems of shopping delivery (‘free hands’; ‘shopping train’); offering services of personalised baggage room (‘cloakroom’) or stimulating interaction between travellers through information exchange systems (‘urban playlist’; ‘good news’). Periurban places need to re-invent their own appeal, offering activities and reasons for the residents to live there beyond the attractiveness of the large city nearby for instance creating distant co-working spaces in existing places such as ‘school-office’ stimulating social life (‘the shared canteen’), generating networks of cultural activities (‘Fline house’) or developing initiatives of disseminated museum (‘nomad art’). A large part of the population living in periurban areas is working in the city nearby. It is hardly there during the day therefore it is important to support means to reinforce social boundaries for instance through the constitution of local social hubs and connectors (‘Neighbourhood collective houses’; ‘Landlord of the spot’), the creation of meeting places between neighbours (‘Evening canteen’; ‘letter kiosk’), the setting of local media (‘through there’) of citizens mutual help networks (‘Public credit’) or of logistic neighbourhood services (‘Post-plus). Promotion of commuting with public transports implies to facilitate a sustainable local mobility towards the local stations through initiatives towards car pooling in Orchie (‘co-parking’) and for circulation within the periurban area through initiatives of bicycle bus from the police on bike (‘accompanying shallows’) or facilitating the mobility of the teenagers on the area (‘eBus’). Agricultural land appears to often in periurban areas as not more than a stock of available land for building. Switching part of the industrial agriculture to short food networks providers means a great potential to rebuild the relationships between cities and the countryside based for instance on promotion of orchards (‘Grow-up’) or of direct purchase (‘Short circuits’). After this first exploratory stage, a follow-up programme of field and implementation activities and in particular a local development of the Territoires en Résidences programme is discussed between the Regional Council of Nord-Pas-de-Calais, La 27e Région and Strategic Design Scenarios. The core idea of Territoires en Résidences is inspired from residences of artists hosted for long periods in a particular context from which to generate new projects in collaboration with the populations located there. In the case of Territoires en Résidences, it’s a multidisciplinary team that settle for 3 weeks over a period of 4 months in a college, a health care centre, a neighbourhood digital centre, a rural train station or in the regional council administration itself. Their goal is to co-design with local stakeholders a future vision articulated in a set of long-term scenarios and a program of concrete short-medium term actions. Since 2008 and the beginning of the programme, about 15 such residences have been experimented in different need areas, hosting situations and configuration of resident’s team. Immersion, it appears, is one way of starting a healthy dialogue and encouraging stakeholders’ capacity building, co-elaboration, ongoing progress and rapid prototyping of new public services or services of general interest. Beyond this localised innovation potential, residences appears as a promising format of activation of local projects to address systemic sustainable transformation at a larger scale (Jégou, Vincent, 2010). Residences relate to an intermediate level of action between micro and macro level: on the one hand, they represent a light process (in time, budget, risk, involvement…) and are strongly localised (rooted locally, based on field work, on participation of people…). On the other hand, they have the critical size to be considered at the regional scale. They acquire the status of ‘demonstrator’: a concrete, sufficiently developed experiment both with enough tangible results and a critical quantity of people involved to represent a significant step forward: residences are the delicate ‘needles’ to activate the local acupuncture! Starting from this core idea and experience, the following issues are considered to build a coherent action plan. The D2PE Direction of Sustainable Development, Foresight and Assessment is the first interlocutor at the Regional Council and its main activity is to develop medium-long term investigation on critical questions for the future of the Nord-Pas-de-Calais region. Such a long-term study on the future of periurban areas has been launched in 2009 in collaboration with the firm RCT, an external Foresight consultant. This type of investigation is likely to build macro-vision of the region, point key area for actions in this complex system and identify particular leverage variables on which to act to fluidify a critical perspective or to get a synergic effect within the interplay of local stakeholders. If we may come back to our metaphor of acupuncture, regional future research is likely to identify the meridian of vivid energy crossing the region, point along them on local initiatives with a strategic potential and indicate the possible mechanism that may activate this vivid potential. Whereas regional future research is able to show potential strategies at a framework level, it is not likely to connect with the field, whether to capture in-depth local specific knowledge as a user-centred ethnographic-like approach would do or, and even less, to activate and support local initiatives. A programme of 10 co-ordinated residences per year is foreseen to tackle with this issue of field experimentation and implementation. The progressive results of the ongoing study on future of periurban areas will be brought together with the seven strategic points proposed during the creative exploration workshop in order to identify promising residences and draft directions to orient them. The scheme of a residence as experienced since now within the Territoires en Résidences programme will allow to explore promising interactions between the macro perspectives and local context: does the vision suggested by the regional future studies represents a meaningful orientation from the local context hosting the residence? Can the population there with the help of the residents identify a series of projects linking bottom-up existing initiatives with top-down regional opportunities? What can be inferred from this local experience and what are the lessons learn to reshape the vision developed through the future studies? Such iterative loops between macro and micro perspectives along the residence should both catalyse the local development of local projects in synergy with a more rooted framework vision. More residences will be hold in the same or similar hosting contexts to allow comparison and cross-fertilisation. More visions will be explored through residences localised in closed areas in order to foster possible synergies between them and build a network of experimentations. The D2PE is not the only department of the Regional Council to take part in this development process. Other sectors covered by the regional authority such as the Direction of Colleges showed their interest. This involvement from the perspective of different need areas will both enrich the possible synergies explored at a local level through the residences and promote transversal collaboration within the services of the regional authorities. In order to facilitate these cross fertilisations, a spin-off of La 27e Région will be developed within the Regional Council. This local embedded public innovation lab will be initially embodied by a single staff detached from La 27e Région and installed for a one-year period in the Regional Council. His task will be to programme and co-ordinate the different residences, to foster the involvement of the different Directions and Departments of the regional administration, to enlarge the focus of the process and engage with more stakeholders within the local administration and finally to sediment this process of innovation through an acupuncture of residences within the normal procedure of the Region. Jégou, F., “Social innovations and regional acupuncture towards sustainability” in Zhuangshi, Beijing, 2010. Jégou, F. and Manzini, E., 2008. Collaborative Services, Social Innovation and Design for Sustainability with essay by Bala, P., Cagnin, C., Cipolla, C., Green, J., van der Horst, T., de Leeuw, B., Luiten, H. Marras, I., Meroni, A., Rocchi, S., Strandbakken, P., Stø, E., Thakara, J., Un, S., Vadovics, E. Warnke, P. and Zacarias A. Edizioni Poli.design, Milan. Jégou F., Liberman J., Girardi S. and Bernagozzi A., 2008. Design for Social Innovation, Enabling replication of promising initiatives for sustainable living in Brussels and Paris. Changing the Change design research conférence, Torino. Jouen, M. 2009, “Des services publics à la conception des services au public”, Futuribles, décembre 2009. Design des politiques publiques, ed. by La 27e Région, La Documentation Française, 2010. Mulgan G. 2006. “Social Innovation: what is it, why it matters, how it can be accelerated” with inputs from Tucker, S. Ali, R. and Sanders, B. The Young Foundation, London. Mulgan G. 2007. “Ready or not? Taking innovation in the public sector seriously”, Nesta. Thakara, J. 2005. “In the bubble: designing in a complex world”, MIT Press, Cambrige.